Creating a free marriage certificate is a wonderful way to celebrate the union between you and your spouse. Although it is not a valid marriage license, using printable marriage certificates can be an entertaining way to show your wedding attendees how appreciative you are of their presence on your special day. 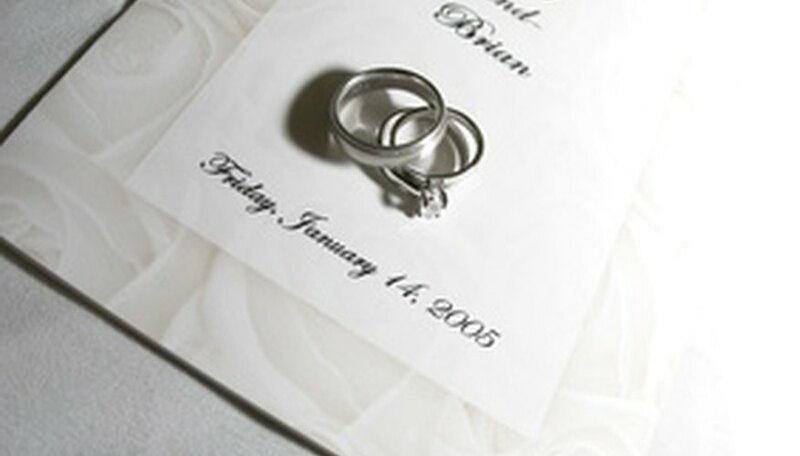 Some marriage certificate applications include using your printable marriage certificate as laminated place mats on the wedding tables, handing out certificates with some crayons to keep children occupied during the ceremony and reception or placing a copy of the framed marriage certificate, complete with a picture of the bride and groom, on your guestbook table. Choose from the free marriage certificates that appeal to you on Free Printable Certificates (see Resource 1). Download the blank PDF template of the marriage certificate you choose. Open the downloaded template with your PDF reader software, and print out the blank marriage certificate. Save the document to your computer for future reference. Customize the certificate by filling in the blanks with your name, your spouse's name and date of marriage. Use a glitter pen to add elegance. Choose from the free marriage certificates that appeal to you from Certificate Street (see Resource 2). Download the fully customizable PDF template of the marriage certificate you choose. Open the downloaded template with your PDF reader software. Place your cursor on "Type Here" to customize the blank template with your name, your husband's name and date of marriage. Save the document to your computer for future reference. Print out the customized marriage certificate. You will need PDF reader software to download the free marriage certificate templates. Purchase colored paper or photo stock paper from the dollar store and add to your printer paper receptacle to create colorful and one-of-a-kind marriage certificates. Jennifer MacPhaden began writing professionally in 1996 creating legal documents and promotional literature for real estate publications in Toronto, Ontario, Canada. She is currently an Early Childhood Educator with a strong teaching focus on the creation of cognitively enhanced children's stories and curriculum. MacPhaden has a Law Clerk Degree and an Early Childhood Education Degree from Durham College, located in Oshawa, Ontario, Canada.